Dogs are checked in & their belongings are put into their lockers. They are then taken to their respective play areas in the garden (according to size and engergy levels) where they have free play with other socialized dogs under careful supervison. Plenty of toys are made available to them as well as splash pools throughout the day. 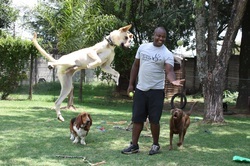 Dogs participate in organised games such as tunnel running, the ball pit, the scratch patch, play equipment, ball fetching and a variety of other fun games. Those with higher energy levels are taken for 2 hour walks to help relieve some of their excess energy. A slower version of the morning activities with one on one attention. Some dogs may choose to swim during this time while others prefer to cool off in our splash pools available throughout the day. Special needs are attended to, lunch is served to puppies and treats are given to adults (if permitted). It’s time for our dogs to put up their paws for a rest. Dogs & puppies can choose to rest either on comfortable beds or outside in the beautiful garden where they can unwind and relax. 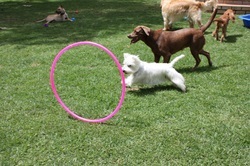 Dogs get to play with each other and run around in the garden as well as choose what activities they would like to participate in. This time is used for an 'energy outlet' where dogs play as much as they want while under careful supervision (as always). Any dogs that are booked in for grooming are done towards the end of the day to ensure they are nice and clean when they go home. 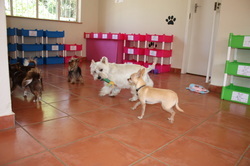 All dogs are prepared for home time and settle down in their play areas, some resting while others enjoy light play while waiting for their owners to arrive.